He danced with Lisa at the 100th Delivery Party. 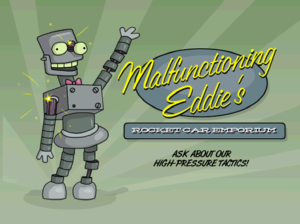 Malfunctioning Eddie: Hi, I'm Malfunctioning Eddie, and I'm malfunctioning so badly, I'm practically giving these cars away!!! 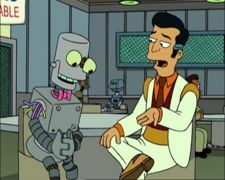 Fry: Actually we’ve met once before. This page was last edited on 10 June 2016, at 16:26.